Home Valley Station, owned by the Indigenous Land Corporation in the East Kimberley region of far North Western Australia is both a working cattle station and a premium tourism operation, providing guests with the ultimate Australian outback experience. The property has excellent accommodation with two swimming pools and Dusty Bar & Grill, which provides live local entertainment. Guest can enjoy a range of activities including Cattle Musters, Horse Riding, Natural waterhole swimming, Barramundi Fishing, Boating, Ancient Gorge Walks, Bish Walking and Indigenous Cultural Tours. Home Valley Station offers a range of activities including fishing, boating, ancient gorge walks, bird watching, horse riding, cattle mustering and a number of Indigenous cultural experiences. The property has recently completed an extensive redevelopment, building world-class tourist facilities which also include a brand new Dusty Bar & Grill, two pools and conference facilities. Home Valley Station offers accommodation for all budgets from the luxurious Grass Castles on idyllic Bindoola Creek, to the Homestead Guesthouse Rooms, safari style eco tents, and camping across two camping grounds. A 700,000 acre outback oasis, the property is nestled at the base of the majestic Cockburn Range and is located 120km from Kununurra along the famous Gibb River Road. Owned by the Indigenous Land Corporation, Home Valley Station is a working cattle station and premium tourism operation in the Kimberley region of far north Western Australia. Rate includes breakfast, taxes, services and free access to the property nine self-guided walking trails. Located in a tranquil bush setting, the safari-style tents offer a more luxurious alternative to camping. 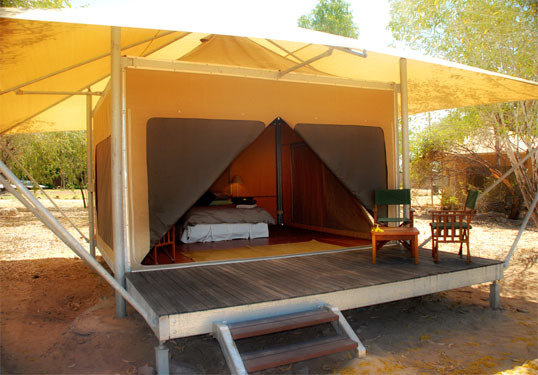 The private tented cabins provide a cool and comfortable retreat, with king-sized bed, fans and private timber deck looking onto the magical Kimberley landscape. facilities are shared. This is a truly unique Kimberley wilderness experience, with no television and no phones, to allow you to simply sit back and relax in the Australian outback. Grass Castles are perfect for families where children under 12 years old can stay and have breakfast for free. Grass Castles can sleep up to 4 person using the rooms king bed, day bed and a rollaway bed. Reminiscent of the steel and timber homesteads of the early pastoral pioneering settlers, the Grass Castles are free standing and feature floor-to-ceiling glass doors farming a stunning direct view of the Creek below. 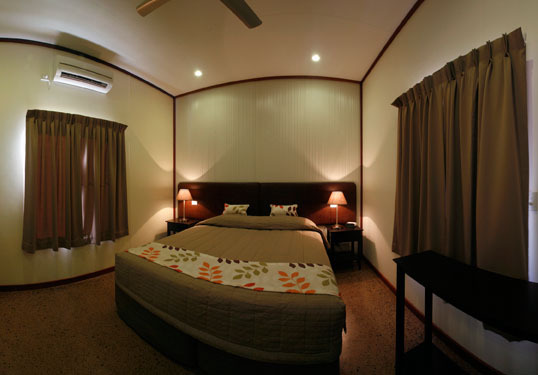 Rooms are air-conditioned and feature a king-sized bed and boast a private verandah with daybed. Stay 2 nights and save. Rate includes breakfast, taxes, services and free access to the property nine self-guided walking trails. Stay 3 nights or more and save. Rate includes breakfast, taxes, services and free access to the property nine self-guided walking trails. Stay 5 and Save, Rate includes 5 night accommodation in Grass Castle room for 2 adults, Buffet Breakfast, Self paced resort activities, services and taxes. Centrally located the Homestead Guesthouse Rooms are set moments away from the famous Dusty Bar & Grill, lagoon-style pool and station store. Guest rooms are comfortable and tastefully appointed and each feature a king-sized bed, private bathroom and air conditioning. Surrounding the courtyard, guests have private access to beautifully manicured gardens and an inviting swimming pool. Stay 3 night or more and save. Rate includes breakfast, taxes, services and free access to the property nine self-guided walking trails. 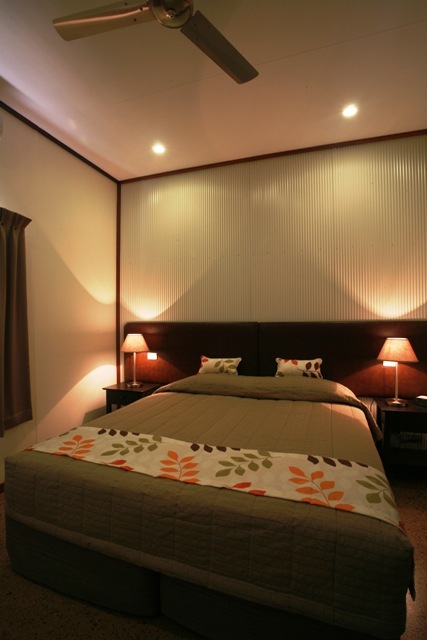 Rate includes 5 night accommodation for 2 adults, breakfast ,self paced activities, services and taxed. Book 2 nights and save. Guests staying in Terrace Rooms will enjoy a complimentary buffet breakfast in the restaurant and a nightly turn down service. These beautifully appointed rooms have an outdoor living space complete with day beds and a dining suite. Children 12 years old or under stay free using existing bedding. Rate includes breakfast, taxes, services, free indigenous guest activities program and return transfer from Ayers Rock Airport (Uluru, Connellan Airport). - Within 24 hours prior to arrival (AEST) full cancellation fee of full rate per confirmed room per night cancelled all pre-booked meals Voyages transfers and all pre-booked Voyages day tours. In contracting to provide accommodation and/or arrange flights and transfers for you Home Valley Station does so strictly upon these Booking Terms & Conditions and Conditions of Carriage. These Booking Terms and Conditions and Conditions of Carriage are set out on Home Valley Station website at http://www.hvstation.com.au/legals/terms-conditions.php. By booking directly through www.hvstation.com.au you warrant and agree that you have read these Booking Terms & Conditions and Conditions of Carriage and agree to be bound by them. Bookings of 10 rooms or more bookings accompanied by a tour leader irrespective of the number of rooms or bookings where names of individual guests cannot be provided at the time of reservation are considered Group Bookings. All Group Bookings must be requested via the Voyages Travel Centre by contacting 1300 134 044 or +61 (2) 8296 8010 or groups@voyages.com.au.